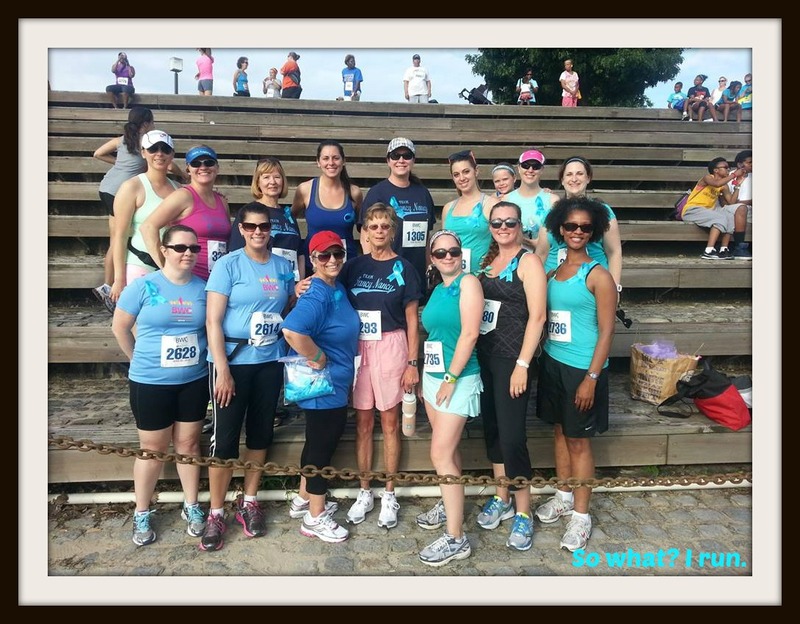 Baltimore Women’s Classic 5K 2013 – Meghan & Team Fancy Nancy | So What? I run. This past Sunday I had the honor of running the Baltimore Women’s Classic on team Fancy Nancy with a dear friend of mine, Meghan. The team was formed in honor of her mother, Nancy, who is a 5 year cancer survivor. Initially, I wanted to find out how she got involved with the BWC, but I ended up finding out more about how she became a runner. Below is my interview with her. Me: How did you find out about BWC? Meghan: I saw a promotional item up at Mercy Hospital. Dylan had just turned 1 and I was ready to do something for myself. My mother’s cancer diagnosis and subsequent treatment, giving birth to my son and then nursing for a year…all of this had set the stage for a dire need to give back to myself and to focus on my own health. Me: Is this the reason why you started running? Meghan: BWC’s training program is absolutely HOW I started running. The WHY I started running was very much because I wanted to do something about my health. I have ovarian and breast cancer in my direct genetic line and my family has a history of heart disease and diabetes. I had this tiny baby at home and I wanted to make some real changes so that maybe he would grow up a healthier child. Me: Did your mom use the BWC when she was fighting cancer? Meghan: No, my mom was very fortunate to have resources available to her and an extended family and friendship circle to nurture her and support her through the years she was sick and in recovery. However she sat for hours with women and heard about the challenges they faced without as much help or as consistent support. Me: Do you and your mom run the races together every year? Meghan: My mom doesn’t run. She’s a fast walker! The BWC is the only race we have done, to date, together each year. I have ran all of my longest distances (half marathon and full marathon) as a charity runner, fundraising for the Baltimore Women’s Classic. We’ve raised about $5K for the BWC including teams for the 5K, and fundraising/donations in support of my longer distances. Meghan: Running has taught me that I am much more capable than I ever thought I was. Running has made me confident, less anxious and happier. Running makes me a better wife, mother and friend. Running provides with me with an Independence from the rest of my day and time to just be with myself. Me: What was/is the most challenging part of running? Me: What is the most rewarding part of running? Me: What is your next big race and why did you chose it? Meghan: My next big race is the Marine Corps Marathon. I chose it because I wanted to run such a historic marathon and attempt the distance in another city, than my own. This entry was posted in Runners Inspiring Runners, Running and tagged BWC, inspiring runners, interviews, Marathon Training, runner profile, runners, Running by SoWhatIRun. Bookmark the permalink. That’s my girl! My heart! Thank you BWC and all the runners who run for those of us who can’t and for the women who depend upon our sisters to get us through the wrost time of our lives. Thank you for bringing attention to this great event and women runners! Thank you Nancy! It was a beautiful race and Meghan is just plain amazing. I’ll definitely run this again next year.